Special Fire Yajna this Sunday, January 24, 2016 ~ The Toronto Hare Krishna Temple! As Hare Krishnas, ceremonies are a big part of our spiritual practice. Almost all major times of life are marked by some time of ceremony. From the time a child takes it's first grains, to the time of initiation, and even when someone is about to pass from this world, auspicious ceremonies can often be performed and mantras are regularly chanted. This upcoming weekend, the Toronto Hare Krishna temple is welcoming Brahma Muhurta das from New York, USA. 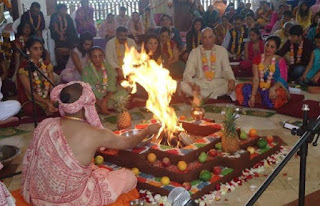 Brahma Muhurta das is specially trained in teaching qualified devotees how to perform fire yajnas (pronounced "YUG-yuh"). A fire yajna is a ceremonial ritual wherein ghee (clarified butter), grains and other items are offered into fire amidst the chanting of mantras. It is a beautiful ritual that brings a level of auspiciousness and peacefulness to the atmosphere. This Sunday, January 24, 2016, we will be hosting a special Sunday Feast at the Toronto Hare Krishna temple. Brahma Muhurta das will be leading a special fire yajna which will be performed during the normal class time (6:45pm to 7:30pm) and everyone in attendance will get a chance to observe. The purpose of this yajna will be to seek blessings from Lord Krishna for the temple and the community of devotees as we embark on the year 2016. A warm invitation goes out to you and your family to come to the temple this upcoming Sunday evening!